Part of raising great cattle is to be able to turn down the highest offer. When Charlie Schreiner III saw Measles as a 3 year old he offered $1000 for her. T.D. Terry Kelsey offered a new dually truck for her which at that time was worth about $6500. As leading producers wanted to buy her see was retained by the Dickinson family and produced Cheetah, Texas Measles, Ranger's Measles, Texas Ranger Jr., Old Measles, Mr. Measles, all natural service or AI. By embryo she produced Tri W Delivery's Measles, Fantasy, and Rural Measles. 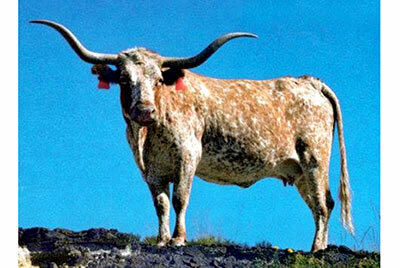 After producing a goodly set of genetics for DCCI, she was consigned to the Denver National Western sale in 1979. It was not that we wanted to throw her away, but we wanted to show the nation what a really great TL cow would bring. She was purchased by Montgomery, McCassland and Moore, a partnership, for $17,000, a record for any TL in history. Johnny Hoffman was the contending bidder. Spring of 1979 Measles produced Measles Super Ranger who was her best siring son. Knowing it was a mistake to sell Measles I bought a half interest in MSR and bred him several years. For the partnership she was flushed at the DCCI embryo center and produced more breed leading progeny of that day, a lifetime total of 23.